Perfluorooctanoic acid (PFOA) and perfluorooctane sulfonic acid (PFOS) are the most investigated substances of the group of per- and polyfluorinated chemicals (PFCs). Whereas for PFOS regulatory measures are already in force on international level (inclusion in Stockholm Convention on Persistent Organic Pollutants) such activities are missing for PFOA. The environmental concerns of PFOA, which are summarized in the present study, underline the necessity of regulatory measures on an international level for PFOA. Since it seems more likely to agree on a regulation within the European Union first, a regulatory strategy based on the European chemicals regulation REACH (EC No. 1907/2006), is discussed in the present study. PFOA is persistent in the environment, ubiquitous present in surface waters, and subject to long-range transport. It accumulates in biota, especially in top predators. PFOA is increasingly analyzed in food items, and in drinking water. PFOA’s intrinsic properties such as its persistency (P), its potential for bioaccumulation (B) and its toxicity (T) suggest that PFOA is a promising candidate for being identified as a Substance of Very High Concern (SVHC) under REACH. Because of the dispersive occurrence of PFOA in the environment, the presence in imported products, and the use of PFCs, which can degrade to PFOA in various consumer products, a restriction under REACH seems to be the most effective regulatory measure to minimize human and environmental exposure to PFOA in the European Union. Due to its intrinsic properties, PFOA fulfills the REACH PBT-criteria. The next regulatory step will be the identification of PFOA and its ammonium salt (APFO) as SVHC according to REACH and the addition to the REACH Candidate List. As a second step, a restriction proposal will be prepared to include both substances and precursors into REACH Annex XVII. Per- and polyfluorinated chemicals (PFCs) are emerging pollutants of the 21st century. These man-made chemicals have been produced since the 1950s. Due to their outstanding properties – they provide water, oil, and grease repellency and are very stable − certain PFCs have been used in a variety of consumer products. A number of studies are available reporting the occurrence of these chemicals in all environmental media as well as in humans [1–4]. In total, according to an OECD survey, the group of produced and used PFCs consists of more than 600 compounds . They are characterized by a fully (per-) or partly (poly-) fluorinated carbon chain in connection with different functional groups. Two compounds from the PFC family are well known: Perfluorooctane sulfonic acid (PFOS) and perfluorooctanoic acid (PFOA). PFOS has recently been identified as a persistent organic pollutant (POP) and was included into Annex B of the Stockholm Convention on Persistent Organic Pollutants . For PFOA only some national measures exist worldwide for the time being. For example, the Environmental Protection Agency of the United States (US-EPA) agreed with eight fluoropolymer and -telomere manufacturers on a PFOA-stewardship program in 2006 . The first goal of the agreement was a 95 % emission reduction of PFOA, its precursors, and related higher homologue chemicals until 2010 using the emission data of the year 2000 as a baseline. The second goal is the elimination of these chemicals by 2015 . Canada prepared a risk management scope for PFOA and long chain PFCs in 2010  and a draft screening assessment for PFOA, its salts, and its precursors . The scope is currently under revision. Canada has an agreement with industry to work on the elimination of PFOA residuals from products sold in Canada . In Europe some national regulatory activities are present for PFOA, i.e. the ban of PFOA from consumer products in Norway from 2013 on . In Germany recommended maximum concentrations for drinking water are available [12, 13]. A Europe-wide regulation is missing so far. The aim of this paper is (i) to summarize the concerns of PFOA from an environmental point of view, (ii) to assess whether PFOA is a persistent, bioaccumulative and toxic (PBT) substance according to the European Chemicals Regulation (REACH EC No. 1907/2006), and (iii) to illustrate a strategy to phase out PFOA in the EU using REACH. It is not the aim of this paper to be a review. In parts only selected studies and exemplary studies are mentioned, which are helpful to support the intention of the study. Additionally, further information needs are formulated. In the following the abbreviation PFOA (CAS. No. 335-67-1) refers to the acid PFOA (Figure 1) as well as to the conjugate base perfluorooctanoate (PFO). Both species are in equilibrium, whereas the fraction of each species depends on the pH of the environmental media and the pKa of PFOA. The general relationship of pH and pKa is given by the Henderson-Hasselbalch equation . In the literature pKa values in the range of −0.2 to 3.8 are discussed for PFOA [15, 16]. Therefore, under normal environmental conditions (i.e. pH 7) more than 99 % is present as conjugate base PFO. In environmental and human samples, generally, PFO is measured. However, in most cases PFOA is documented for these samples in the literature. Only in cases where it is important to distinguish between both of the PFOA-species and where species specific knowledge is available it is clearly indicated that either the acid PFOA or the conjugate base PFO is meant in the following. Furthermore, PFOA is used and produced as ammonium salt (APFO) (CAS. No. 3825-26-1). APFO is highly soluble and dissociates in the environment under the formation of PFO. Again, when analyzing samples concerning their APFO content usually PFO is measured. In the literature the concentrations are referred to as PFOA or APFO in most cases. For a better understanding of the present study, the term PFOA stands for APFO and PFO as well. There are other salts of PFOA available as well, i.e. sodium salt, potassium salt and silver salt. These salts are not included in the present paper due to a lack of physico-chemical data and other studies up to the present. PFOA has been mainly used as polymerization aid in the manufacturing of fluoropolymers and in aqueous fluoropolymer dispersions, which are used for paints, photographic film additives and in the textile finishing industry [17, 18]. Furthermore, PFOA has been used in aqueous fire fighting foams [17, 18]. Telomerization and electrochemical fluorination (ECF) are procedures which have been applied to produce PFOA as well as other PFCs . With a radical reaction all hydrogen atoms are replaced with fluorine in the ECF process. The more common production process nowadays is the telomerization. Here, perfluorinated iodides (PFIs) are used as starting point for the formation of PFOA. Since other PFCs are also produced by applying the telomerization process, PFOA might be present in the final product as an unintended by-product or a residue . Whereas the ECF process results in both linear and branched isomers the telomerization process results in linear isomers only. From 1951 to 2004 the estimated total global production of PFOA and APFO was 3600 – 5700 t . Latest data on production volumes are rare. As a result from the US-EPA stewardship program and further activities to substitute the substance in many uses, production of PFOA decreased significantly at least in Europe and North America. Partly, this is documented in annual progress reports of the US EPA stewardship program . For the time period from 2005 to 2050 480 – 950 t of total PFOA emissions are estimated . Results of an OECD survey, which was, however, not answered by all PFOA manufacturers and users, showed that PFOA as well as its ammonium salt was manufactured in four countries in 2008, whereas masses in products are <5.5 t .
Although the production volume of PFOA is relatively low in industrialized countries, it is still detected in a number of consumer products. Especially in products with water, dirt, and grease repellent properties like treated carpets (0.2 to 6 mg kg−1 PFOA ), outdoor jackets (0.08 to 0.6 mg kg−1 PFOA ), and impregnating agents (up to 3.6 μg mL−1 PFOA ) PFOA was found. For example in Norway the import of articles was figured out as main source since there is no manufacturing and use of PFOA itself. Carpets, coated and impregnated paper, textiles, paint and lacquer (12 kg, 1.3 kg, 0.5 kg and 1 kg annual maximal PFOA emission in Norway, respectively) have been identified as a potential source for PFOA in Norway . Some PFCs can degrade to PFOA under environmental conditions. Those precursor compounds are within this study defined by a carbon chain of at least seven perfluorinated C-atoms connected to different functional groups. Examples for those precursors are fluorotelomer alcohols (FTOHs) , Polyfluoroalkyl Phosphoric Acid (PAPs)  and polyfluorinated iodides (PFIs) . These compounds are also present in consumer products, i.e. up to 52 μg mL−1 8:2 FTOH in impregnating agents . The fact that PFOA and its precursors are present in numerous consumer products indicates wide and dispersive sources of the compounds into the environment. Moreover, during the production of fluoropolymers and fluoroelastomers, PFCs can be released into the environment . During the whole life cycle of products containing these compounds, starting with the manufacturing, including the use and ending with the disposal, PFOA and its precursors might be emitted into the environment. Detection of PFOA and precursors in wastewater treatment plant (WWTP) effluents  as well as in air emitted from WWTPs [27–29] give further evidence for the wide dispersive use of PFOA and precursors. Households are one possible source for PFOA and its precursors in municipal WWTPs. Additionally, landfills emit PFOA with their leachates  or release these substances into the atmosphere [29, 31]. There are different reasons which show that the releases of PFOA and APFO into the environment are of concern (Table 1). Most of the concerns are related to the environmental persistence of PFOA. PFOA is not expected to undergo biotic or abiotic degradation in the environment. Tests under laboratory conditions prove the suspected environmental persistence as no degradation was observed . Besides these laboratory tests also monitoring data confirm the persistence of PFOA. For example, PFOA was found in groundwater close to a former fire-training area years after the last use of PFOA containing fire fighting foams on this area . Additionally, its high water-solubility (especially of the conjugate base PFO) characterizes the fate of PFOA in the environment: the aqueous phase is one major pathway for the occurrence and the distribution of PFOA in the environment. Various measurements and studies showed that PFOA is ubiquitously present in oceans and other surface waters [2, 34–36]. The formation of deep ocean water is discussed as a potential sink for PFOA . Sources of PFOA into oceans are rivers and atmospheric deposition. The distribution of PFOA in aqueous media is also of concern when the long-range transport potential of the substance is examined. For example, findings of PFOA in remote areas like the Arctic or the Antarctic give evidence for the long- range transport potential, because PFOA is not known to be used or produced in these regions. Mainly two transport pathways are discussed: (a) Transport of PFOA in ocean currents and (b) transport of precursors in the atmosphere. Precursors are then degraded to PFOA . The contribution of these two transport pathways to the occurrence of PFOA in remote regions is still under discussion [20, 56, 57]. Furthermore, transport of PFOA bound on particles, i.e. directly emitted from industrial facilities  or emitted from oceans is possible as well . Even the transfer of PFOA from particles into the gas phase  and the detection of PFOA in the gas phase  were shown. Because of the low vapor pressure of the conjugate base PFO only the acid PFOA is expected to be present in the gaseous phase [59, 60]. The occurrence of PFOA in biota of remote regions is another topic of concern. It was shown that PFOA accumulates in food webs and findings in top predators are reported . PFOA is toxic for reproduction (Cat 1B) and has carcinogenic potential (in accordance with opinion of Risk Assessment Committee of the European Chemicals Agency (ECHA), [61, 62]). Furthermore, PFOA has a long residence time of 3.5 years in human blood and is present in breast milk [63, 64]. One exposure pathway for humans is nutrition . For example in fish, meat, and vegetables PFOA has been found in low levels [46, 66]. The PFOA load of these food items results most probably from environmental concentrations in water and biota. Also the transfer of PFOA from soil into plants , i.e. after application of PFOA contaminated sewage sludge on fields, or the migration from food packages can be a source for PFOA in food . Another potential human exposure pathway is the occurrence of PFOA in drinking water [48, 68]. In cases where surface waters are used for the production of drinking water, PFOA is not effectively removed by common purification methods . Therefore, the occurrence in surface waters is of concern from a human health point of view as well. It has to be kept in mind that the precursors contribute to the exposure of PFOA to humans and the environment, additionally [24, 25, 54]. Biotic as well as abiotic degradation of those precursors does occur and partly results in the formation of PFOA . Especially indoor air contains up to 10–20 times higher concentrations of these substances than outdoor air, i.e. FTOHs [55, 71–73]. In conclusion, the described concerns about PFOA circumstantiate the impact of the exposure of humans via the environment, which is known as man via environment exposure. From a regulatory point of view these concerns raise the question whether PFOA is a Substance of Very High Concern (SVHC) under REACH. SVHC are substances which for example have persistent (P), bioaccumulative (B) and toxic (T) properties. The available data on PFOA need to be compared with the PBT-criteria defined in REACH. In Annex XIII of the REACH regulation criteria for the identification of PBT-substances are defined. These criteria will be used in the following to assess whether PFOA is a PBT-substance. The relevant criteria and the corresponding PFOA properties are summarized in Table 2. In general, persistence is defined by measured half-lives for the environmental compartments water, sediment, and soil. The numerical values for minimum half-lives in water are 60 days in marine waters, and 40 days in freshwater, 180 days in marine sediment, and 120 days in freshwater sediment, as well as 120 days for the soil compartment. At least one of these values must be exceeded to fulfill the criteria for persistent substances under REACH. Due to the stability of PFOA it is, in general, challenging or even impossible to measure its half-life. Nevertheless, some studies are available showing that no abiotic or biotic degradation was observed [74–78]. The atmospheric half-life of PFOA derived by analogy from short-chain perfluorinated carboxylic acids is 130 days . For hydrolysis a half-life greater than 92 years is reported based on observations of the APFO concentration in buffered aqueous solutions . Taking all the information together, PFOA does not undergo abiotic or biotic degradation under environmental conditions. Therefore, PFOA is considered to fullfil the persistence criteria of REACH. The numerical criterion under REACH defining that a substance is bioaccumulative is a bioconcentration factor (BCF) in aquatic species higher than 2000. For PFOA only BCFs far below 2000 were measured in bioconcentration studies using fish and other aquatic species and an exposure route via the surrounding water . Bioaccumulation factors (BAFs) were determined from field measurements. Compared to BCFs, BAFs take all possible routes of exposure into consideration, whereas the BCF excludes dietary uptake. Reported BAFs were also far below 2000 [42, 81–83]. There is no defined threshold value for BAFs in Annex XIII of REACH, but taking into account the BCF threshold, again the numerical criterion for bioaccumulation of Annex XIII is not fulfilled. For assessing the bioconcentration data the high water solubility of PFOA could be the reason for the effective excretion of PFOA by fish via gill permeation, facilitated by high water throughput. Therefore, it is not surprising that no BCF > 2000 is reported in the literature for PFOA and it is also the reason, why several authors came to the conclusion that PFOA does not bioaccumulate in aquatic organisms . However, this possible excretion pathway does not exist for air breathing animals [91, 92] and therefore bioconcentration values in fish may not be the most relevant endpoint to consider. Also, octanol-water partition coefficients (KOW) can be taken into consideration under REACH to assess the bioaccumulation potential of a chemical. To the best of our knowledge there are no measured KOW values available for PFOA. Only estimates for the neutral PFOA acid are reported [93, 94]. However, if this KOW for the neutral PFOA is applied to environmental conditions, where also PFO is present, the pKa is needed . As the pKa is, as already outlined above, subject to broad discussion, it should be avoided to assess the bioaccumulation potential of PFOA in the environment based on not yet assured properties. Annex XIII of the REACH regulation was revised in March 2011 (Commission Regulation (EU) No. 253/2011). For assessing the bioaccumulation potential of a substance the criteria were expanded to include more recent findings with respect to biomagnification, bioaccumulation in terrestrial species, concentrations in human body fluids, etc. . However, this weight of evidence evaluation needs expert judgment, since there are no hard, i.e. quantitative, definitions of these new criteria. To the best of our knowledge the new criteria were up to now not used for the assessment of chemicals under REACH. Information that PFOA bioaccumulates can be drawn from biomagnifications factors (BMFs) and trophic magnification factors (TMFs). Both of them are related to concentrations in predator/prey relationships, whereas TMFs take into consideration a food web. Generally, factors higher than one indicate accumulation. Studies report TMFs or BMFs greater than one, indicating bioaccumulation of PFOA. For example studies on dolphins  and caribou  clearly show that PFOA is bioaccumulative to a certain degree. Moreover, for the food chains walrus (liver)/clam, narwhal (liver)/Arctic cod, and celuga (liver)/Arctic cod the BMFs are above one, respectively, indicating bioaccumulation . Also for a Canadian Arctic marine food web (sediment and different organisms (macroalgae, bivalves, fish, seaducks, and marine mammals)) a TMF larger than one was reported. Even after protein-normalization, the TMF value was greater than one . BMFs between 0.9 and 11 were calculated in the terrestrial food chain of lichen, caribou, and wolf, living in the remote Canadian environment, indicating bioaccumulation. Furthermore, calculated TMFs were greater than one, indicating trophic magnification, too . Field studies are complex and therefore difficult to judge concerning their reliability. Each of the field studies has its drawbacks due to sample collection in different years, the sampling of body tissues and fluids instead of whole body or uncertainty of prey constitution etc. and may not be considered as a standalone proof for the bioaccumulation potential of PFOA. Nevertheless taken together all studies their results can be considered overall conclusive. The weight of evidence of these studies suggests that PFOA can biomagnify in the food chain as indicated by biomagnifications factors and trophic magnification factors larger than one. Also the detection of PFOA in human body fluids, such as blood, milk and fat, can be used as additional information to assess whether PFOA is a bioaccumulating substance as defined in Annex XIII of the REACH regulation. PFOA has been found in human blood from all around the world . In addition the following observations are of relevance: Five to eight times higher levels have been found at locations, where people had been exposed to PFOA contaminated drinking water indicating accumulation in the blood compartment [100, 101]. Time trend studies show that PFOA levels are significantly associated with the time being exposed to PFOA, i.e. during work as a ski waxer [102–104]. And recent studies strongly indicate that PFOA levels increase with age [105, 106]. Elimination half-lives of PFOA in humans of 3.5  or 3.26  years indicate the bioaccumulation potential of PFOA. Occurrence of PFOA in endangered species and in vulnerable populations can be used in accordance with Annex XIII of the REACH regulation to assess the bioaccumulation properties of a substance as well. Because polar bears live in remote regions where no direct PFOA source is known, detection of PFOA in polar bears indicates the uptake from the surrounding environment . In conclusion, a number of data are available demonstrating the bioaccumulation potential of PFOA especially in air breathing animals. Moreover, the detection in human body fluids of the general population together with long elimination half-lives is of very high concern. Additionally, it is of special concern that PFOA biomagnifies in endangered species or vulnerable populations as shown by the findings of PFOA in polar bears. Thus, it can be concluded that PFOA is a bioaccumulative substance in accordance with Annex XIII of the REACH regulation. Toxic substances under REACH are those with no-observed effect concentrations (NOECs) below 0.01 mg L−1 or substances classified as being carcinogenic, mutagenic or toxic for reproduction for humans according to regulation EC No 1272/2008. These criteria for toxic substances are defined in Annex XIII of the REACH regulation. The acute and toxic effects of PFOA to fathead minnow (Pimephales promela) have been analyzed . The threshold value of Annex XIII is not met. The same was observed for aquatic invertebrates . In March 2010 Norway submitted a proposal for the harmonized classification and labeling of PFOA and APFO in the EU. In December 2011 the Risk Assessment Committee of the ECHA came to the conclusion that classification according to regulation EC No. 1272/2008 for PFOA is Repr. 1B and STOT RE 1 . In agreement with the Annex XIII of the REACH regulation the category for reproduction toxicity and specific organ toxicity after repeated dose fulfill the toxicity criteria. PFOA clearly fulfills the P and T criteria of REACH Annex XIII. For the B-criterium a weight of evidence approach mainly based on field studies investigating the accumulation of PFOA in different food webs results in the conclusion that PFOA is a bioaccumulative substance in agreement with REACH Annex XIII. Therefore, PFOA is considered to fulfill the PBT-criteria as defined in REACH. Because of the dissociation of PFOA as well as APFO under environmental conditions the results for PFOA can be transferred to APFO. Hence, APFO fulfills the REACH PBT-criteria, too. The REACH regulation provides different options for regulatory measures . The PBT-properties of PFOA and APFO in combination with its different source are exceptionally of the PFOA case. (Figure 2) needs to consider both parts to protect the environment. Strategy for regulation of PFOA under REACH. PFOA and APFO fulfill the PBT-criteria under REACH, which is one possible requirement for a substance to be identified as a SVHC according to REACH, Art. 57d. The identification of SVHC is based on the intrinsic properties of the substances mainly. From a human health point of view PFOA and APFO also fulfill the criteria for the classification as toxic for reproduction (Art. 57c). The next step is to identify the SVHC-properties of PFOA and APFO according to a formal process defined in REACH. Therefore, Germany and Norway are preparing a proposal assessing the PBT-properties of PFOA and APFO in detail. Subsequently to the submission to ECHA this proposal is open for public consultation. Finally, the Member State Committee, which is established with the ECHA, needs to identify the SVHC-properties of PFOA according to Art. 59. Once PFOA and APFO are identified as SVHC ECHA will include the substances into the Candidate List – the list of substances proposed for authorization. This process will start in 2013. 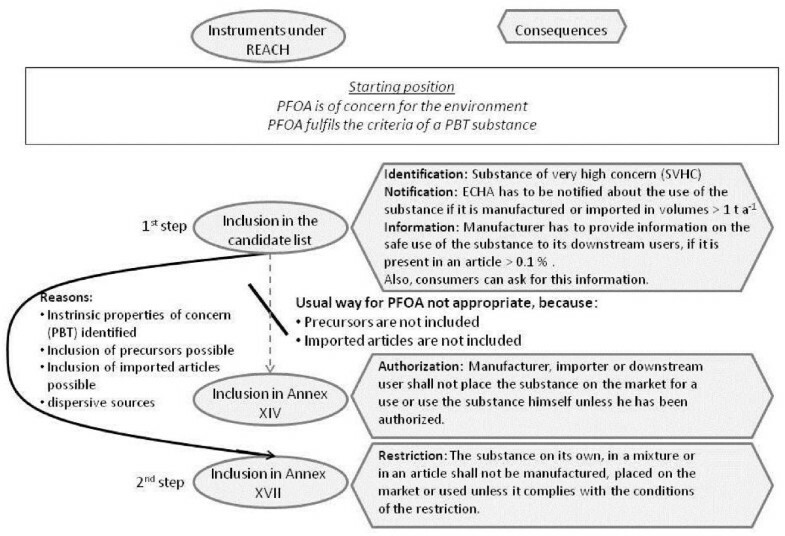 The identification of PFOA and APFO as SVHC in the EU might indicate to states outside of the EU the need to minimize risks, and might also be a starting point for other regulatory measures on national or international level. Furthermore, this might be a strong signal to manufacturers and downstream users to replace PFOA and APFO. Authorization is the foreseen instrument in the REACH regulation to control the risks of SVHC. Once PFOA and APFO are included in the Candidate List they could be included into Annex XIV of the REACH regulation. Following inclusion into this Annex, manufacturers, importers and downstream users would not be allowed to use or to place these substances as such on the European market without an authorization of any single use. Risk control, good functioning of the internal market, and the replacement of SVHC by substitutes are aims of the authorization. Assuring the safe use of the substances, manufacturers, importers and downstream users can apply for authorization using the substances on its own, in a mixture or in an article. The following three reasons make the instrument of authorization ineffective to control the emissions of PFOA in the environment and the environmental exposure: (i) PFOA and APFO themselves are produced and imported into the EU in decreasing amounts. (ii) Consumer articles containing PFOA, i.e. textiles, are partly imported into the EU and authorization does not apply for imported articles. (iii) Also precursors contribute to the presence of PFOA into the environment. However, precursors of SVHC are not included in the substance definition and therefore won’t be included into Annex XIV. Therefore, the contribution of precursors and residues in (imported) articles to the environmental exposure of PFOA is not addressed by the authorization instrument. If an authorization based on the intrinsic properties of a substance is coming into effect, a restriction based on the same risk will not be possible. An option to regulate manufacturing, placing on the market or use of a substance on its own, in a mixture or in an article is the inclusion into Annex XVII of the REACH regulation (Restriction, Art. 67). A restriction might also include residue limits for PFOA and its precursors in articles. For PFOA and APFO as PBT-substances this seems to be appropriate to reduce the environmental PFOA concentrations effectively, because especially the residues in articles need to be controlled successfully. As also precursor compounds contribute to the environmental exposure with PFOA, these compounds need to be included in the restriction as well. To decide how an effective restriction needs to be designed more information about the residues of PFOA in articles and mixtures are necessary. Furthermore, relevant precursors need to be identified and included in the restriction. When suggesting a restriction, information about possible substitutes is essential: Some substitutes are already known but not much is known about their properties and their long-term effects. A restriction of PFOA, its salts, and its precursors under REACH is envisaged by Germany and Norway and will be initiated in 2013. This study demonstrates that PFOA and APFO are PBT-substances and promising SVHC candidates according to REACH. Hence, PFOA and APFO need to be added to the REACH Candidate List. This step alone does not minimize exposure effectively and does not address the concerns of PFOA appropriately. A restriction for production, placing on the market and/or use of PFOA and APFO in certain articles and mixtures is, therefore, necessary as a follow-up. For the future a regulatory process beyond the European level is required to achieve a global protection of humans and the environment from PFOA exposure. Since there are numerous different PFCs manufactured and used worldwide, the intrinsic properties of other PFCs need to be evaluated in future, too. Especially, their fate and behavior in the environment has to be monitored to find out if further regulatory measures are needed. Literature review and analysis of data obtained in the review were performed to achieve the aim of the study. Furthermore, interpretation of the REACH regulation was necessary. For that reason, also a workshop with experts from different EU-member states, the EU-Commission and the ECHA was hosted in Dessau-Roßlau (Germany) in November 2011. We thank the participants of the workshop on “Regulatory issues of PFCs” hosted by the Federal Environment Agency in Germany for their valuable input in assessing the bioaccumulation properties of PFOA, especially Greg Hammond from Environment Canada. We acknowledge the cooperation with our colleagues, Heidi Morka, Ingunn Correll Myhre, Stine Husa and Marit Kopangen from the Norwegian Climate and Pollution Agency for the work on regulation of PFOA under REACH. Furthermore, we thank the anonymous reviewers for their helpful comments on our manuscript. All authors contributed in equal parts to this publication. All authors read and approved the final manuscript. This paper does not necessarily reflect the opinion or the policies if the German Federal Environment Agency.